Disrespect – The Social B. Be Honest. Be Humble. Be YOU. Focused, Intelligent, Motivated… Oh and Cute! Did Diddy And Drake Really Fight Over Cassie? Remember when we first received word that Diddy and Drake got into a fight at Club LIV during DJ Khaled’s 39th birthday party? Well, originally everyone believed that their little incident was over Cassie, but it turns out that was just a classic rumor that spread. Instead the two were actually fighting over money. 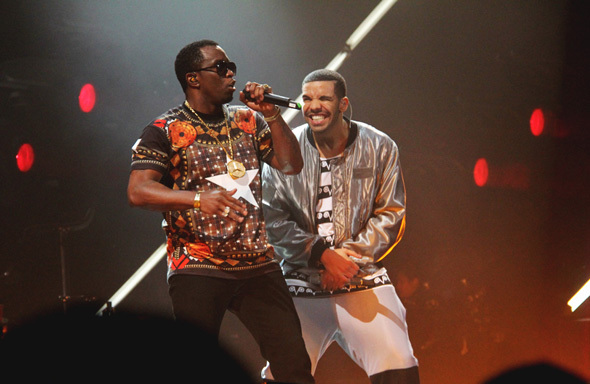 According to TMZ, Diddy was mad at Drizzy for moving forward with a song that he was supposed to be in on. Sources say producer Boi-1 da approached both Diddy and Drake with the song to record 8 months ago, but unfortunately Diddy just sat on it. Well, Drake was tired of waiting and went ahead and record the song on his own and it’s done well, which really ticked Puff off. At the club, on Monday, Diddy saw Drake for the first time since the song released. Sources close to Diddy say he confronted Drake, and when Drake blew him off … well let’s just say that was one of his worst mistakes. “You’ll never disrespect me again,” Diddy said just moments before punching Drake. Drake later ended up in the ER because during all the commotion he was hit in his shoulder and irritated an old injury. Drake just can’t stop bumping heads with people, but as far as the song goes and by what we know I would have to say that I don’t blame him. Drake is all about making hits so of course if he’s feeling the fire under him to do so he’ll do whatever he thinks is necessary to make sure the name “Drake” stays relevant. Now as for Diddy on the other hand, who said he wasn’t passionate about his music? Although he was in the wrong for punching Drake in the face, I do understand him when it comes to making money, which was the moral behind the song. Now granted, Puff just can’t go around punching people because he doesn’t get his way. Plus a club is just not the best place to talk business especially with a bunch of alcohol around when people develop a little liquid courage. Do you agree with Diddy for being mad after Drake moved forward with a song that they’d just been sitting on for 8 months? Posted on December 11, 2014 June 4, 2015 Author sydneyb27Categories EntertainmentTags Club Fight, Club LIV, Diddy, Disrespect, Dj Khaled, Drake, Fight, RappersLeave a comment on Did Diddy And Drake Really Fight Over Cassie?